Elephants usually have 26 teeth: the incisors, known as the tusks, 12 deciduous premolars, and 12 molars. Unlike most mammals, which grow baby teeth and then replace them with a single permanent set of adult teeth, elephants are polyphyodonts that have cycles of tooth rotation throughout their lives. The chewing teeth are replaced six times in a typical elephant's lifetime. Teeth are not replaced by new ones emerging from the jaws vertically as in most mammals. Instead, new teeth grow in at the back of the mouth and move forward to push out the old ones. The first chewing tooth on each side of the jaw falls out when the elephant is two to three years old. The second set of chewing teeth falls out at four to six years old. The third set falls out at 9–15 years of age, and set four lasts until 18–28 years of age. The fifth set of teeth falls out at the early 40s. The sixth (and usually final) set must last the elephant the rest of its life. Elephant teeth have loop-shaped dental ridges, which are thicker and more diamond-shaped in African elephants. In other words, an elephant's teeth grow like a shark's teeth? Sharks’ teeth are instrumental to their diet and hunting habits. They are used as the chief tools for grabbing, killing and tearing at their prey. Due to their sheer size and nature, shark teeth have even become collectible, particularly for fishermen and hunters. The teeth of these fearsome creatures are unique in several ways. First, they are embedded within the gum of the shark, rather than being rooted within the actual jaw, as is the case with most other toothed animals. This allows them to be replaced more easily, without pain and discomfort to the animal. This leads to the next interesting characteristic of shark teeth, they are replaced on a regular basis. In most species, teeth are replaced as they are lost or damaged in hunting and eating. In other species, entire rows of teeth are replaced at a time. Several rows (usually about five) of teeth are grown in a special groove in the jaw. As they develop and the existing teeth in use need to be replaced, the rows move forward to replace the front row. Sharks can have approximately 3000 teeth in their mouths at any given time. The rate at which this replacement occurs varies between once every eight days and once in several months. A shark can lose over 30 000 teeth in its lifespan! More teeth are lost and replaced during summer than winter as the shark is more active in terms of feeding and hunting in the warmer months. The teeth are placoid scales that have been modified for this specific purpose. They resemble human teeth in that they have a central pulp cavity with dentine and an outer layer of enamel. They develop on the inner jaw cartilage and are attached to the dental membrane. The crown cap of the tooth develops first, followed by the root. The shape of the tooth depends on the species and its specific requirements. Generally, sharks do not chew their food, but use their teeth to grab, hold and rip the prey into bite-sized chunks. Teeth can be sharp, wedge-shaped and wide with a serrated edge, as in the case of a Great White Shark. This shape is best suited to grabbing and tearing prey apart. Species like the Lemon and Mako sharks have thin, sharp teeth that are ideal for catching and gripping slippery fish. Bottom dwellers, like the Nurse Shark or Angel Shark, have thick, conical or flat teeth at the backs of their mouths. These are designed to crush crabs and other molluscs found on the ocean floor. Sharks that feed on plankton, like the Whale Shark, have little need for teeth as food is passed through large filters and then swallowed. In these cases, the teeth are reduced. Because the teeth are the only part of the shark to be composed of bone, they are the part most likely to be fossilised, providing researchers with vital information about past and present species. The teeth of the Megalodon, for example, have provided much information regarding this ancient shark’s feeding, mating and migrating habits. It is hoped that the sharks of today will continue to yield interesting and essential details about the world centuries, even millennia, from now, through the secrets held in their fossilised teeth. Sharks may have up to 3,000 teeth at one time. ... Most sharks do not chew their food, but gulp it down whole it in large pieces. Their teeth are not able to chew food, but only to tear it into mouth-sized pieces. Some bottom dwellers crush the shell of their prey, but still do not thoroughly chew the food like we do. Which ones are lemon sharks and nurse sharks? Also, how the hell did Megalodon's teeth help providing information about their mating habits? The lemon shark (Negaprion brevirostris) is a species of shark from the family Carcharhinidae. Lemon sharks can grow to 3.4 metres (11 ft) in length. They are often found in shallow subtropical waters and are known to inhabit and return to specific nursery sites for breeding. Often feeding at night, these sharks use electroreceptors to find their main source of prey: fish. Lemon sharks enjoy the many benefits of group living such as enhanced communication, courtship, predatory behavior, and protection. This species of shark gives birth to live young, and the females are polyandrous and have a biennial reproductive cycle. Lemon sharks are not thought to be a large threat to humans. The Ginglymostomatidae are a cosmopolitan family of carpet sharks, containing two monotypic genera of nurse sharks. Common in shallow, tropical and subtropical waters, these sharks are sluggish and docile bottom-dwellers. Nurse sharks typically attack humans only if directly threatened. The name nurse shark is thought to be a corruption of nusse, a name which once referred to the catsharks of the family Scyliorhinidae. The nurse shark family name, Ginglymostomatidae, derives from the Greek words ginglymos meaning "hinge" and stoma meaning "mouth". Megalodon (Carcharocles megalodon), meaning "big tooth", is an extinct species of shark that lived approximately 23 to 2.6 million years ago (mya), during the Early Miocene to the end of the Pliocene. It was formerly thought to be a member of the Lamnidae family, making it closely related to the great white shark (Carcharodon carcharias). However presently there is near unanimous consensus that it belongs to the extinct family Otodontidae, which diverged from the ancestry of the great white shark during the Early Cretaceous. Its genus placement is still debated, authors placing it in either Carcharocles, Megaselachus, Otodus, or Procarcharodon. Scientists suggest that megalodon looked like a stockier version of the great white shark, though it may have looked similar to the basking shark (Cetorhinus maximus) or the sand tiger shark (Carcharias taurus). Regarded as one of the largest and most powerful predators to have ever lived, fossil remains of megalodon suggest that this giant shark reached a maximum length of 18 meters (59 ft) with the average size being 10.5 meters (34 ft). Their large jaws could exert a bite force of up to 110,000 to 180,000 newtons (25,000 to 40,000 lbf). Their teeth were thick and robust, built for grabbing prey and breaking bone. I am unable to answer any more questions on this subject. Shark, any of numerous species of cartilaginous fishes of predatory habit that constitute the order Selachii (class Chondrichthyes). Sharks, together with rays and skates, make up the subclass Elasmobranchii of the Chondrichthyes. Sharks differ from other elasmobranchs, however, and resemble ordinary fishes, in the fusiform shape of their body and in the location of their gill clefts on each side of the head. Though there are exceptions, sharks typically have a tough skin that is dull gray in colour and is roughened by toothlike scales. They also usually have a muscular, asymmetrical, upturned tail; pointed fins; and a pointed snout extending forward and over a crescentic mouth set with sharp triangular teeth. Sharks have no swim bladder and must swim perpetually to keep from sinking to the bottom. There are more than 400 living species of sharks, taxonomically grouped into 14–30 families, according to different authorities. Several larger species can be dangerous to humans. Numerous sharks are fished commercially. However, overfishing in the late 20th and early 21st centuries substantially reduced the populations of some shark species. Shark species are nondescript in colour, varying from gray to cream, brown, yellow, slate, or blue and often patterned with spots, bands, marblings, or protuberances. The oddest-looking sharks are the hammerheads (Sphyrna), whose heads resemble double-headed hammers and have an eye on each stalk, and the wobbegongs (family Orectolobidae), whose skin flaps and protective coloration closely resemble the seafloor. The vernacular of shark names indicate colours in living species, such as the blue (Prionace glauca), the white(Carcharodon carcharias; also known as the great white shark), and the lemon (Negaprion brevirostris) shark. The whale shark (Rhincodon typus) and the basking shark (Cetorhinus maximus), both of which may weigh several tons, are harmless giants that subsist on plankton strained from the sea through modified gill rakers. Whale sharks may grow up to 18 metres (59 feet) in length, whereas basking sharks may reach 14 metres (46 feet) fully grown. All other sharks prey on smaller sharks, fish, squid, octopuses, shellfish, other invertebrates, and, in some species, trash. The largest among the more predatory species is the voracious 6-metre (20-foot) white shark, which attacks seals, dolphins, sea turtles, large fish, and occasionally people. The more sluggish Greenland shark (Somniosus microcephalus) of cold deep waters feeds on seals, large fish, and even swimming reindeer; they may also scavenge whale carcasses. Normally, sharks feed on fish, often attacking in schools. Open-ocean species such as the mackerel (Lamna), mako (Isurus), and thresher(Alopias) sharks frequently feed near the surface and are much sought after with rod and reel for sport. Beautifully streamlined and powerful swimmers, those open-ocean sharks are adept at feeding on fast tuna, marlin, and the like. Bottom-feeding species of sharks are stout, blunt-headed forms that tend to have more-sluggish habits. The shellfish eaters among them have coarse, pavement like, crushing teeth. Fertilization in sharks is internal. The male introduces male gamete into the female by using special copulatory organs (claspers) derived from the pelvic fins. The young in many species hatch from eggs within the female and are born alive. Other species may lay eggs or nurture their young in the uterus with a placental attachment to the mother, like humans. Some species may even consume their siblings before they are born. The origin of sharks is obscure, but their geologic record goes back at least to the Devonian Period (419.2 million to 358.9 million years ago). Fossil sharklike fish appeared in the Middle Devonian Epoch and became the dominant vertebrates of the Carboniferous Period (358.9 million to 298.9 million years ago). Modern sharks appeared in the Early Jurassic Epoch (201.3 million to 174.1 million years ago) and by the Cretaceous Period (145 million to 66 million years ago) had expanded into the present-day families. Overall, evolution has modified shark morphology very little except to improve their feeding and swimming mechanisms. Shark teeth are highly diagnostic of species, both fossil and modern. Sharks’ geographic ranges are not well known. Their extensive movements are related to reproductive or feeding activities or to seasonal environmental changes. Tagging returns from large sharks on the east coast of the United States indicate regular movements between New Jersey and Florida, and blue sharks have been recovered after crossing the southern Atlantic Ocean. A tagged spiny dogfish (Squalus acanthias) was recovered after traveling about 1,600 km (1,000 miles) in 129 days. Advances in tracking technologies include the use of satellite tags that continuously beam a signal to orbiting satellites whenever the shark surfaces and in that manner reveal north-south movements, transoceanic movements, and roaming and migratory patterns that are beginning to be understood for many species. Some members of the Carcharhinus genus—most notably the bull shark (C. leucas)—enter fresh waters. Riverine sharks are small to medium-sized and are exceptionally voracious and bold. Information on shark ecology and individual and group actions has provided increased insight into their behaviour. Because large sharks feed on lesser ones, the habit of segregation by size appears vital to their survival. In a uniform grouping, dominance between various species is apparent in feeding competition, suggesting a definite nipping order. All sharks keep clear of hammerheads, whose maneuverability enhanced by the rudder effect of the head gives them a swimming advantage over other sharks. Sharks circle their prey, disconcertingly appearing seemingly out of nowhere and frequently approaching from below. Feeding behaviour is stimulated by numbers and rapid swimming when three or more sharks appear in the presence of food. Activity progresses from tight circling to rapid crisscross passes. Under strong feeding stimuli, excitement can intensify into a sensory overload that may result in cannibalistic feeding, or “shark frenzy,” in which injured sharks, regardless of size, are devoured. Sharks may abstain from food for long periods, and in captivity they may refuse to feed. Feeding is inhibited in large males during courtship and in gravid females while on the nursery grounds. Areas selected for giving birth are usually free of large sharks. In locating food, the shark primarily uses the chemical senses, particularly the olfactory. Visual acuity is adapted to close and long-range location and to distinguishing moving objects more by reflection than by colour, in either dim or bright light. Pit organs over the body serve as distance touch receptors, responding to displacement produced by sound waves. Irregularly pulsed signals below 800 hertz will bring sharks rapidly to a given point, suggesting acoustic orientation from considerable distances. In addition, electroreception, the ability to detect minute electrical activities, works effectively at short distances in sharks. Electroreception may be the last sensory system used to direct sharks toward live prey just before they capture it. Feeding habits vary with foraging methods and dentition. Sharks with teeth adapted to shearing and sawing are aided in biting by body motions including a rotation of the body, twisting movement of the head and body, or rapid vibration of the head. In coming to position, the shark protrudes its jaws, erecting and locking the teeth in position. In Australia, New Zealand, South Africa, and elsewhere along coasts where sharks are considered a nuisance or pose a threat to humans, public beaches often have lookout towers, bells and sirens, or nets. Since 1937, meshing has been employed off Australian beaches to catch sharks, using gill nets suspended between buoys and anchors, parallel to the beach and beyond the breaker line. The nets enmesh sharks from any direction, and, though touching neither the surface nor the bottom and spaced well apart, the nets give simple effective control. The most-feared species is the white shark, whose erratic presence in American coastal waters is associated with infrequent attacks along the California coast and elsewhere. Other sharks involved in attacks on humans are the tiger (Galeocerdo cuvier), bull, oceanic whitetip (C. longimanus), blue, and hammerhead. Of course, the larger the shark, the more formidable the attack, but several small specimens can be hazardous as well, a fact well attested to by seasonal attacks off the southeastern coast of the United States. Attacks on humans occur when sharks are hungry, harassed, or, in some cases, defending territory, though many interactions with humans appear more likely to be due to mistaken identity. Provocation is heightened by the kicking or thrashing vibrations people make in the water (which to sharks resemble the irregular movements of a wounded fish), the presence of speared fish or bait in the water, or the presence of blood from wounds or menstruation. Most injuries occur on the lower limbs and buttocks. It has been estimated that there are about 100 shark attacks worldwide per year. Less than 25 percent of those are fatal, largely a result of hemorrhage and shock. It should be noted, however, that shark attacks are much less frequent than other aquatic mishaps. Among the threats from humans that sharks face is finning, the practice of harvesting the lateral and dorsal fins and the lower tail fin from a shark by commercial fishing operations and others worldwide. After the shark has been captured and its fins have been removed, its body, which is most likely still alive, is often cast overboard to save weight and cargo space. The practice is thought to have arisen in China about 1000 CE primarily for the purpose of supplying fins for shark fin soup served to guests at social occasions where the dish is symbolic of the host’s status. Although most shark fin products are traded through Hong Kong, some are sent to local markets around the world that supply restaurants. The yearly global demand for shark fin soup results in the harvesting of tens of millions of sharks each year. Campaigns led by animal rights groups and environmentalists have discouraged the consumption of shark fin soup. Since 2011, some restaurants around the world have removed the soup from their menus, and, beginning in 2012, it was no longer served at official state functions in China. Sharks, together with rays and skates, make up the subclass Elasmobranchii of the Chondrichthyes. (i) Skate, (order Rajiformes), in zoology, any of numerous flat-bodied cartilaginous fishes constituting the order Rajiformes. Skates are found in most parts of the world, from tropical to near-Arctic waters and from the shallows to depths of more than 2,700 metres (8,900 feet). Most classifications distribute skates among approximately 25 genera across three families—Rajidae, Arynchobatidae, and Anacanthobatidae—while others place all skates into family Rajidae. Skates are rounded to diamond-shaped in form. They have large pectoral fins extending from or nearly from the snout to the base of the slender tail, and some have sharp “noses” produced by a cranial projection, the rostral cartilage. Skates may be solid coloured or patterned. Most have spiny or thornlike structures on the upper surface, and some have weak electrical organs (which may be used in communication) in the tail. Typical skates (Rajidae), the majority of the living forms, have two dorsal fins on the tail; the Arynchobatidae have one, and the Anacanthobatidae have none. The mouth and gill openings of all skates are situated on the underside of the body, and all, so far as is known, lay eggs. The eggs, the so-called mermaid’s purses often found on beaches, are oblong and protected by leathery cases. Skates vary in size. The little, or hedgehog, skate (Leucoraja erinacea) of the western Atlantic, for example, is adult at a length of 50–54 cm (20–21.3 inches) or less. In contrast, both the big skate (Beiringraja binoculata) of the eastern North Pacific Ocean and the common skate (Dipturus batis) of the western North Atlantic Ocean may reach 2.5 metres (8.2 feet) long as adults. The skate’s tail lacks the stinging spines found in electric rays. They are innocuous bottom dwellers, often found lying partly buried. They swim with a graceful undulating movement of their pectoral fins. Skates feed on mollusks, crustaceans, and fishes, trapping active prey by dropping down on it from above. Skates have long generation times and low reproductive rates, two characteristics that make them vulnerable to sudden population declines. Several species—such as the common skate, a popular food fish in northwestern Europe and the Mediterranean Sea—are considered threatened by conservation organizations because of overfishing by the commercial fishing industry. Skates are harvested for their edible “wings” (or pectoral fins) or captured as bycatch in fishing nets. The International Union for Conservation of Nature (IUCN) has listed the common skate as an endangered species since 2000 and as a critically endangered species since 2006. (ii) Ray, any of the cartilaginous fishes of the order Batoidei, related to sharks and placed with them in the class Chondrichthyes. The order includes 534 species. Rays are distinguished from sharks by a flattened, disklike body, with the five gill openings and the mouth generally located on the underside. Rays are further distinguished from sharks by their greatly enlarged, winglike pectoral fins, which extend forward along the sides of the head above the gill openings. Many rays swim and breathe differently from sharks, propelling themselves with their pectoral fins and taking in water for respiration through large openings (spiracles) on the upper surface of the head, rather than through the mouth. The ray’s tail is generally long and slender and in many species bears one or more sharp, saw-edged, venomous spines that can be used to inflict painful wounds. Rays are predominantly marine and are found in all oceans. Many are slow-moving bottom dwellers. Manta rays feed on plankton and small animals; others take various fishes and invertebrates, sometimes damaging commercially valuable shellfish beds. Other than skates, most or possibly all rays bear living young. Fertilization is internal, the male introducing gamete into the female by means of special copulatory organs (claspers) that are the modified edges of the pelvic fins. Rays can be classified into the following groups: electric rays, sawfishes, skates, and various families of rays that have slender, whiplike tails equipped with spines and that are all-inclusively called stingrays, or whip-tailed rays. The electric rays (suborder Torpedinoidei) are distinguished by large paired electric organs between the pectoral fins and the head, with which they can give powerful shocks either for defensive purposes or to kill prey. The electric rays have a smooth and naked skin; the head and trunk with the pectoral fins form a circular disk, and the tail is short and stout. About 20 species are known to inhabit warm seas, with some reaching a weight of 200 pounds (90 kg). All other types of rays, which lack electric organs, generally have a rough skin, often bearing strong spines. The sawfishes (family Pristidae) have a snout that is modified into a long blade possessing a series of strong teeth on each side. About six species are known from warm seas, frequenting sandy shores and estuaries. In the skates (suborder Rajoidei), the large pectoral fins extend to the snout and backward, stopping abruptly at the base of a slender tail. In contrast to other rays, skates produce eggs; these are large and oblong in shape with dark, leathery shells having a tendril at each corner by which they become fastened to seaweed or other objects. Skates lack the long, slender barbed spine that distinguishes stingrays. The most widespread skates belong to the genus Raja of the family Rajidae. The remaining rays comprise the suborder Myliobatoidei and consist of whip-tailed rays (family Dasyatidae), butterfly rays (Gymnuridae), stingrays (Urolophidae), eagle rays (Myliobatidae), manta rays (or devil rays; Mobulidae), and cow-nosed rays (Rhinopteridae). Common to the rays of all these families is a long, slender, whiplike tail that usually has a barbed spine connected with a poison gland; this spine is capable of inflicting serious wounds and is a dangerous weapon when the tail is lashed. Almost all of these rays are inhabitants of warm seas, except for a few species of stingray that live in the rivers of South America. So, a skate is a type of ray? Cottage cheese is a fresh cheese curd product with a mild flavor. The first known use of the term "cottage cheese" dates back to 1831. It is believed to have originated because the simple cheese was usually made in cottages from any milk left over after making butter. The ancient Mesopotamians made a type of salty, sour cheese very similar to cottage cheese that dates back to at least 3000 B.C. A common legend is that it was invented when a desert traveler filled his sheep stomach saddle bags with milk prior to beginning his journey. Cottage cheese was widely promoted during World War 1, along with other dairy products, as to save meat for infantry rations. This was shown in the form of many war posters. Cottage cheese is drained, but not pressed, so some whey remains and the individual curds remain loose. The curd is usually washed to remove acidity, giving sweet-curd cheese. It is not aged or colored. Different styles of cottage cheese are made from milk with different fat levels and in small-curd or large-curd preparations. Pressed cottage cheese becomes hoop cheese, farmer cheese, pot cheese, or queso blanco. Curd size is the size of the chunks in the cottage cheese. The two major types of cottage cheese are small-curd, high-acid cheese made without rennet, and large-curd, low-acid cheese made with rennet. Rennet is a natural complex of enzymes that speeds curdling and keeps the curd that forms from breaking up. Adding rennet shortens the cheese-making process, resulting in a lower acid and larger curd cheese, and reduces the amount of curd poured off with leftover liquid (whey). Sometimes large-curd cottage cheese is called "chunk style." Cottage cheese can be eaten in a variety of different ways: by itself, with fruit and sugar, with salt and pepper, with fruit puree, on toast, with tomatoes, with granola and cinnamon, in salads, as a chip dip, as a replacement for mayonnaise in tuna salad or as an ingredient in recipes such as jello salad and various desserts. Cottage cheese with fruit, such as pears, peaches, or mandarin oranges, is a standard side dish in many "home cooking" or meat-and-three restaurants' menus in the United States. It is also used in dishes such as lasagna, in place of ricotta. A 113-g (4-oz) serving of 4% fat product has about 120 calories, 5 g fat (3 g saturated), 3 g carbohydrates, and 12 g protein. It also contains about 500 mg sodium, 70 mg calcium, and 20 mg cholesterol. Some manufacturers also produce low-fat and nonfat varieties. A fat-free kind of a similar serving size has 80 calories, 0 g fat (0 g saturated), 6 g carbohydrates, and 14 g protein. Cottage cheese is a low-calorie cheese with a mild flavor. Its popularity has grown in the last few decades, and it's often recommended as part of a healthy diet. Cottage cheese doesn't only offer a lot of protein — it's also packed with essential nutrients. For these reasons, it's widely used by athletes and in weight loss plans. Cottage cheese is soft, white and creamy. It's considered a fresh cheese, so it does not undergo an aging or ripening process to develop flavor. As a result, it has a very mild flavor compared to aged cheeses. Cottage cheese is made from the curds of pasteurized cow's milk and can be made with various levels of milk fat, such as non-fat, reduced-fat or regular. It's also offered in different curd sizes, usually small, medium or large. Moreover, it's available in creamed, whipped, lactose-free, reduced sodium or sodium-free varieties. You can enjoy this versatile cheese by itself or as an ingredient in recipes. Bottom Line : Cottage cheese is a soft, white cheese with mild flavor. It is a fresh cheese offered with different milk fat levels and curd sizes. The nutrition profile of cottage cheese varies depending on the level of milk fat used and amount of sodium added. • Phosphorus: 30% of the Reference Daily Intake (RDI). • Sodium: 30% of the RDI. • Selenium: 29% of the RDI. • Vitamin B12: 24% of the RDI. • Riboflavin: 22% of the RDI. • Calcium: 14% of the RDI. • Folate: 7% of the RDI. It also has decent amounts of vitamins B1, B3 and B6, as well as vitamin A, iron, magnesium, potassium, zinc and copper. Take note of how much protein a one-cup serving contains. Protein accounts for over 70% of the calories in cottage cheese. Bottom Line:Cottage cheese is an excellent source of protein with relatively few calories. It is also packed with many nutrients like B vitamins, calcium, phosphorus and selenium. Making cottage cheese is a simple process. You can even do it at home. The process starts with curdling milk. This is done by adding an acidic substance like lime juice or vinegar to warm milk. When the acidity of the milk increases, curds of casein protein separate from the whey, the liquid part of the milk. Once the curd has solidified, it's cut into pieces and cooked until more moisture is released. It is then washed to remove the acidity and drained to remove the moisture. The result is a sweeter curd that can be easily crumbled. Finally, ingredients can be added to flavor the finished product, including cream, salt, herbs and spices. Bottom Line : Cottage cheese is made by adding an acid to milk, which causes the milk to curdle. Then, the curd is drained and crumbled to make the final product. Weight loss diets often include cottage cheese. This is partly because of its high protein and low calorie content. One study followed people who maintained a diet that included high-protein foods like cottage cheese for one year. It showed that the diet helped decrease body weight by an average of 6.2 lbs (2.8 kg) in women and 3.1 lbs (1.4 kg) in men. Moreover, high intakes of protein, such as the casein in cottage cheese, have been shown to help increase feelings of fullness. In fact, cottage cheese seems to stimulate feelings of fullness in a manner similar to that of eggs. These feelings of fullness can lead to reduced calorie intake and weight loss. Also, cottage cheese offers high amounts of calcium. Studies have linked calcium and other components of dairy to reduced weight and easier weight maintenance, especially when combined with exercise. Furthermore, dietary calcium has been associated with metabolic processes that reduce fat accumulation and accelerate fat loss. Bottom Line : Cottage cheese is high in protein and calcium, both of which have been associated with weight loss. Cottage cheese is popular among athletes and people who exercise. Because of its high protein content, it's a great food to incorporate into your diet if you're looking to build muscle mass. A diet including high-protein foods can help you increase muscle mass when combined with resistance training. Also, the specific proteins in cottage cheese are particularly effective at helping you build muscle. Casein accounts for 80% of its protein content and is considered to be a slowly absorbed protein. It's just as effective as whey protein at building muscle and better at inhibiting muscle breakdown due to its slower absorption. Casein also promotes prolonged absorption of the amino acid leucine, which has been linked to increased muscle building capacity. Many bodybuilders like to eat cottage cheese before bed. This leads to a sustained release of amino acids into the blood and muscles during the night, which may reduce muscle breakdown. Bottom Line : Cottage cheese is packed with casein protein. Casein is a slowly absorbed protein that promotes muscle gain and helps prevent muscle breakdown. Cottage cheese has also been associated with other health benefits. Insulin resistance can lead to the development of type 2 diabetes and heart disease. The calcium in dairy products is believed to reduce insulin resistance. One study suggests that eating dairy products may lower the risk of developing insulin resistance by 21%. In addition to calcium, cottage cheese is a good source of phosphorus and protein. These nutrients have consistently been linked to improved bone health. A one-cup (226 grams) serving of cottage cheese can offer you almost 30% of the RDI of selenium. This mineral has been shown to increase antioxidant protection in the blood. Bottom Line : Cottage cheese can help reduce the risk of developing insulin resistance and heart disease. It can also help improve bone health and provide antioxidant protection. Cottage cheese's mild flavor and soft texture make it easy to include in your meals and recipes. • Pancakes or waffles: Mix it into the batter as a substitute for milk. • Salads: Add it to your favorite salads for extra protein. • Fruit: Mix it with fruits like berries, sliced bananas, peach slices, mandarin wedges and melon chunks. • Granola: Top it with granola and drizzle with honey. • Sour cream substitute: It works well as a substitute in recipes. • Dipping sauces: Mix it into dipping sauces as a substitute for milk. • Smoothies: Blend it with some milk and fruits for a fruit smoothie. • Toast: It makes a creamy, protein-rich spread. • Baked goods: Bake it into muffins, cakes, bread or dinner rolls. • Mayo substitute: Spread it on sandwiches or use it in recipes. • Scrambled eggs: It'll give your eggs an extra creamy texture. • Lasagna: Use it as a substitute for ricotta cheese. Bottom Line : Cottage cheese is a versatile ingredient that you can incorporate into many different meals and recipes. Cottage cheese is a dairy product, which can cause problems for some people. The lactose content of cheese decreases as the cheese ages. Because cottage cheese is a fresh, unripened cheese, it contains more lactose than aged cheeses like Parmesan, cheddar or Swiss. Moreover, cottage cheese may contain even more lactose if additional milk is added to the curd. For these reasons, cottage cheese is not a good choice if you're lactose intolerant. When people with lactose intolerance eat cottage cheese, they may experience digestive problems such as bloating, gas, diarrhea and stomach pain. In addition to lactose, cottage cheese contains casein and whey, which some people are allergic to. If you have experienced an allergic reaction with any dairy product, then you may not be able to tolerate cottage cheese. Bottom Line : Cottage cheese can cause digestive problems if you are lactose intolerant. It can also cause allergic reactions in those allergic to dairy or milk proteins. Cottage cheese is a curd cheese with a mild flavor and smooth texture. It's high in many nutrients, including protein, B vitamins and minerals like calcium, selenium and phosphorus. If you're looking to lose weight or build muscle, then cottage cheese is among the most beneficial foods you can eat. Airplane, also called aeroplane or plane, any of a class of fixed-wing aircraft that is heavier than air, propelled by a screw propeller or a high-velocity jet, and supported by the dynamic reaction of the air against its wings. For an account of the development of the airplane and the advent of civil aviation. The essential components of an airplane are a wing system to sustain it in flight, tail surfaces to stabilize the wings, movable surfaces to control the attitude of the plane in flight, and a power plant to provide the thrust necessary to push the vehicle through the air. Provision must be made to support the plane when it is at rest on the ground and during takeoff and landing. Most planes feature an enclosed body (fuselage) to house the crew, passengers, and cargo; the compartment for the pilot, and sometimes also the crew, in an aircraft or spacecraft, the area from which the pilot operates the controls and instruments to fly the plane. An aircraft in straight-and-level unaccelerated flight has four forces acting on it. (In turning, diving, or climbing flight, additional forces come into play.) These forces are lift, an upward-acting force; drag, a retarding force of the resistance to lift and to the friction of the aircraft moving through the air; weight, the downward effect that gravity has on the aircraft; and thrust, the forward-acting force provided by the propulsion system (or, in the case of unpowered aircraft, by using gravity to translate altitude into speed). Drag and weight are elements inherent in any object, including an aircraft. Lift and thrust are artificially created elements devised to enable an aircraft to fly. Understanding lift first requires an understanding of an airfoil, which is a structure designed to obtain reaction upon its surface from the air through which it moves. Early airfoils typically had little more than a slightly curved upper surface and a flat undersurface. Over the years, airfoils have been adapted to meet changing needs. By the 1920s, airfoils typically had a rounded upper surface, with the greatest height being reached in the first third of the chord (width). In time, both upper and lower surfaces were curved to a greater or lesser degree, and the thickest part of the airfoil gradually moved backward. As airspeeds grew, there was a requirement for a very smooth passage of air over the surface, which was achieved in the laminar-flow airfoil, where the camber was farther back than contemporary practice dictated. Supersonic aircraft required even more drastic changes in airfoil shapes, some losing the roundness formerly associated with a wing and having a double-wedge shape. By moving forward in the air, the wing’s airfoil obtains a reaction useful for flight from the air passing over its surface. (In flight the airfoil of the wing normally produces the greatest amount of lift, but propellers, tail surfaces, and the fuselage also function as airfoils and generate varying amounts of lift.) In the 18th century the Swiss mathematician Daniel Bernoulli discovered that, if the velocity of air is increased over a certain point of an airfoil, the pressure of the air is decreased. Air flowing over the curved top surface of the wing’s airfoil moves faster than the air flowing on the bottom surface, decreasing the pressure on top. The higher pressure from below pushes (lifts) the wing up to the lower pressure area. Simultaneously the air flowing along the underside of the wing is deflected downward, providing a Newtonian equal and opposite reaction and contributing to the total lift. The lift an airfoil generates is also affected by its “angle of attack”—i.e., its angle relative to the wind. Both lift and angle of attack can be immediately, if crudely, demonstrated, by holding one’s hand out the window of a moving automobile. When the hand is turned flat to the wind, much resistance is felt and little “lift” is generated, for there is a turbulent region behind the hand. The ratio of lift to drag is low. When the hand is held parallel to the wind, there is far less drag and a moderate amount of lift is generated, the turbulence smooths out, and there is a better ratio of lift to drag. However, if the hand is turned slightly so that its forward edge is raised to a higher angle of attack, the generation of lift will increase. This favourable increase in the lift-to-drag ratio will create a tendency for the hand to “fly” up and over. The greater the speed, the greater the lift and drag will be. Thus, total lift is related to the shape of the airfoil, the angle of attack, and the speed with which the wing passes through the air. Weight is a force that acts opposite to lift. Designers thus attempt to make the aircraft as light as possible. Because all aircraft designs have a tendency to increase in weight during the development process, modern aerospace engineering staffs have specialists in the field controlling weight from the beginning of the design. In addition, pilots must control the total weight that an aircraft is permitted to carry (in passengers, fuel, and freight) both in amount and in location. The distribution of weight (i.e., the control of the centre of gravity of the aircraft) is as important aerodynamically as the amount of weight being carried. Thrust, the forward-acting force, is opposed to drag as lift is opposed to weight. Thrust is obtained by accelerating a mass of ambient air to a velocity greater than the speed of the aircraft; the equal and opposite reaction is for the aircraft to move forward. In reciprocating or turboprop-powered aircraft, thrust derives from the propulsive force caused by the rotation of the propeller, with residual thrust provided by the exhaust. In a jet engine, thrust derives from the propulsive force of the rotating blades of a turbine compressing air, which is then expanded by the combustion of introduced fuel and exhausted from the engine. In a rocket-powered aircraft, the thrust is derived from the equal and opposite reaction to the burning of the rocket propellant. In a sailplane, height attained by mechanical, orographic, or thermal techniques is translated into speed by means of gravity. Acting in continual opposition to thrust is drag, which has two elements. Parasitic drag is that caused by form resistance (due to shape), skin friction, interference, and all other elements that are not contributing to lift; induced drag is that created as a result of the generation of lift. Parasitic drag rises as airspeed increases. For most flights it is desirable to have all drag reduced to a minimum, and for this reason considerable attention is given to streamlining the form of the aircraft by eliminating as much drag-inducing structure as possible (e.g., enclosing the math with a canopy, retracting the landing gear, using flush riveting, and painting and polishing surfaces). Some less obvious elements of drag include the relative disposition and area of fuselage and wing, engine, and empennage surfaces; the intersection of wings and tail surfaces; the unintentional leakage of air through the structure; the use of excess air for cooling; and the use of individual shapes that cause local airflow separation. Induced drag is caused by that element of the air deflected downward which is not vertical to the flight path but is tilted slightly rearward from it. As the angle of attack increases, so does drag; at a critical point, the angle of attack can become so great that the airflow is broken over the upper surface of the wing, and lift is lost while drag increases. This critical condition is termed the stall. Lift, drag, and stall are all variously affected by the shape of the wing planform. An elliptical wing like that used on the Supermarine Spitfire fighter of World War II, for example, while ideal aerodynamically in a subsonic aircraft, has a more undesirable stall pattern than a simple rectangular wing. The aerodynamics of supersonic flight are complex. Air is compressible, and, as speeds and altitudes increase, the speed of the air flowing over the aircraft begins to exceed the speed of the aircraft through the air. The speed at which this compressibility affects an aircraft is expressed as a ratio of the speed of the aircraft to the speed of sound, called the Mach number, in honour of the Austrian physicist Ernst Mach. The critical Mach number for an aircraft has been defined as that at which on some point of the aircraft the airflow has reached the speed of sound. At Mach numbers in excess of the critical Mach number (that is, speeds at which the airflow exceeds the speed of sound at local points on the airframe), there are significant changes in forces, pressures, and moments acting on the wing and fuselage caused by the formation of shock waves. One of the most important effects is a very large increase in drag as well as a reduction in lift. Initially designers sought to reach higher critical Mach numbers by designing aircraft with very thin airfoil sections for the wing and horizontal surfaces and by ensuring that the fineness ratio (length to diameter) of the fuselage was as high as possible. Wing thickness ratios (the thickness of the wing divided by its width) were about 14 to 18 percent on typical aircraft of the 1940–45 period; in later jets the ratio was reduced to less than 5 percent. These techniques delayed the local airflow reaching Mach 1.0, permitting slightly higher critical Mach numbers for the aircraft. Independent studies in Germany and the United States showed that reaching the critical Mach could be delayed further by sweeping the wings back. Wing sweep was extremely important to the development of the German World War II Messerschmitt Me 262, the first operational jet fighter, and to postwar fighters such as the North American F-86 Sabre and the Soviet MiG-15. These fighters operated at high subsonic speeds, but the competitive pressures of development required aircraft that could operate at transonic and supersonic speeds. The power of jet engines with afterburners made these speeds technically possible, but designers were still handicapped by the huge rise in drag in the transonic area. The solution involved adding volume to the fuselage ahead of and behind the wing and reducing it near the wing and tail, to create a cross-sectional area that more nearly approximated the ideal area to limit transonic drag. Early applications of this rule resulted in a “wasp-waist” appearance, such as that of the Convair F-102. In later jets application of this rule is not as apparent in the aircraft’s planform. In some flight conditions—descent, preparing to land, landing, and after landing—it is desirable to be able to increase drag to decelerate the aircraft. A number of devices have been designed to accomplish this. These include speed brakes, which are large flat-plate areas that can be deployed by the pilot to increase drag dramatically and are most often found on military aircraft, and spoilers, which are surfaces that can be extended on the wing or fuselage to disrupt the air flow and create drag or to act in the same manner as ailerons. Drag can also be provided by extension of the landing gear or, at the appropriate airspeeds, deployment of the flaps and other lift devices. Lift and drag are roughly proportional to the wing area of an aircraft; if all other factors remain the same and the wing area is doubled, both lift and drag will be doubled. Designers therefore attempt to minimize drag by keeping the wing area as small as possible, while enhancing lift with certain types of trailing-edge flaps and leading-edge slats, which have the ability to increase wing area mechanically. (These devices also alter the camber of the wing, increasing both lift and drag.) A passenger in an aft window seat of a modern airliner can observe the remarkable way in which the wing quite literally transforms itself from a smooth, slim, streamlined surface into almost a half-circle of surfaces by the deployment of a formidable array of lift- and drag-inducing devices. Flaps are extensions of the trailing edge of the wing and can be deflected downward as much as 45°. Many flaps effectively increase wing area, adding to lift and to drag. The angle to which the flaps are deployed determines the relative amount of additional lift or drag obtained. At smaller angles, lift is typically increased over drag, while at greater angles, drag is dramatically increased over lift. Flaps come in a wide variety of types, including the simple split flap, in which a hinged section of the undersurface of the trailing edge of the wing can be extended; the Fowler flap, which extends the wing area by deployingon tracks, creating a slotted effect; and the Kreuger flap, which is a leading-edge flap often used in combination with Fowler or other trailing-edge flaps. Various modern proprietary systems of multiple slotted flaps are used in conjunction with leading-edge slats and flaps, all specially designed to suit the flight characteristics of the particular airplane. Leading-edge flaps alter the camber of the wing and provide additional lift; leading-edge slats are small cambered airfoil surfaces arranged near the leading edge of the wing to form a slot. Air flows through the slot and over the main wing, smoothing out the airflow over the wing and delaying the onset of the stall. Leading-edge slots, which can be either fixed or deployable, are spanwise apertures that permit air to flow through a point behind the leading edge and, like the slat, are designed to smooth out the airflow over the wing at higher angles of attack. The deployment of these devices can be varied to suit the desired flight regime. For takeoff and in the approach to landing, their deployment is generally to provide greater lift than drag. In flight or after touchdown, if rapid deceleration is desired, they can be deployed in a manner to greatly increase drag. All four forces—lift, thrust, drag, and weight—interact continuously in flight and are in turn affected by such things as the torque effect of the propeller, centrifugal force in turns, and other elements, but all are made subject to the pilot by means of the controls. The pilot controls the forces of flight and the aircraft’s direction and attitude by means of flight controls. Conventional flight controls consist of a stick or wheel control column and rudder pedals, which control the movement of the elevator and ailerons (a hinged surface in the trailing edge of an aeroplane wing, used to control the roll of an aircraft about its longitudinal axis) and the rudder, respectively, through a system of cables or rods. In very sophisticated modern aircraft, there is no direct mechanical linkage between the pilot’s controls and the control surfaces; instead they are actuated by electric motors. The catch phrase for this arrangement is “fly-by-wire.” In addition, in some large and fast aircraft, controls are boosted by hydraulically or electrically actuated systems. In both the fly-by-wire and boosted controls, the feel of the control reaction is fed back to the pilot by simulated means. In the conventional arrangement the elevator, attached to the horizontal stabilizer, controls movement around the lateral axis and in effect controls the angle of attack. Forward movement of the control column lowers the elevator, depressing the nose and raising the tail; backward pressure raises the elevator, raising the nose and lowering the tail. Many modern aircraft combine the elevator and stabilizer into a single control surface called the stabilator, which moves as an entity to control inputs. The ailerons are movable surfaces hinged to the trailing edge of each wing, which move in the opposite direction to control movement around the aircraft’s longitudinal axis. If the pilot applies left pressure to the control column (stick or wheel), the right aileron deflects downward and the left aileron deflects upward. The force of the airflow is altered by these control changes, causing the left wing to lower (because of decreased lift) and the right wing to rise (because of increased lift). This differential in lift causes the aircraft to turn to the left. The rudder is a vertical surface, and it controls movement around the aircraft’s vertical axis. It does not cause the aircraft to turn; instead, it counteracts the adverse yaw (rotation around the vertical axis) produced by the ailerons. The lowered wing has both decreased lift and decreased drag; the raised wing has both increased lift and increased drag. The added drag of the raised wing tries to pull the nose of the aircraft toward it (i.e., away from the direction of the turn). Pressure on the rudder is used to counter this adverse yaw. Because the turn results in a net decrease in lift, application of elevator pressure is necessary. Thus, a turn is the result of the combined inputs of the ailerons, rudder, and elevator. Trim tabs are used by the pilot to relieve the requirement of maintaining continuous pressure on the controls. These are smaller surfaces inset into the rudder, elevator, and ailerons, which can be positioned by mechanical or electrical means and which, when positioned, move the control surface to the desired trimmed position. Trimming the aircraft is a continual process, with adjustments necessary for changes to the flight or power controls that result in changes in speed or attitude. The pilot controls thrust by adjustment of the control levers for the engine. In an aircraft with a reciprocating engine these can consist of a throttle, mixture control (to control the ratio of fuel and air going to the engine), and propeller control as well as secondary devices such as supercharger controls or water-alcohol injection. In a turbojet engine, the principal control is the throttle, with auxiliary devices such as water injection and afterburners. With water injection, a water-alcohol mixture is injected into the combustion area to cool it, which allows more fuel to be burned. With afterburners, fuel is injected behind the combustion section and ignited to increase thrust greatly at the expense of high fuel consumption. The power delivered by reciprocating and jet engines is variously affected by airspeed and ambient air density (temperature, humidity, and pressure), which must be taken into consideration when establishing power settings. In a turboprop engine, power is typically set by first adjusting the propeller speed with a propeller lever and then adjusting fuel flow to obtain the desired torque (power) setting with the power lever. The pilot also has an array of instruments by which to check the condition of flight, the engine, and other systems and equipment. In small private aircraft, the instrumentation is simple and may consist only of an altimeter to register height, an airspeed indicator, and a compass. The most modern commercial air transports, in contrast, have fully automated “glass compartment for the pilot, and sometimes also the crew, in an aircraft or spacecraft” in which a tremendous array of information is continually presented on cathode-ray tube displays of the aircraft’s height, attitude, heading, speed, cabin pressure and temperature, route, fuel quantity and consumption, and the condition of the engines and the hydraulic, electrical, and electronic systems. These displays also provide readouts for both routine and emergency checklists. Aircraft are also provided with inertial guidance systems for automatic navigation from point to point, with continuous updating for changing weather conditions, beneficial winds, or other situations. math have become so automated that training emphasis is focused on “resource management” to assure that the crew members keep alert and do not become complacent as their aircraft flies automatically from one point to the next. This array of instrumentation is supplemented by vastly improved meteorological forecasts, which reduce the hazard from weather, including such difficult to predict elements as wind shear and microburst. In addition, the availability of precise positioning from Earth-orbiting satellites makes navigation a far more exact science. Sophisticated defogging and anti-icing systems complement instrumentation for operation in adverse weather. There are three factors that force the increased use of flight simulators in training: the complexity of larger aircraft, the expense of their operation, and the increased complexity of the air-traffic control environment in which they operate. Modern simulators duplicate aircraft exactly in terms of compartment for the pilot, and sometimes also the crew, in an aircraft or spacecraft size, layout, and equipment. They also duplicate the external environment and create a realistic sense of flying by means of the three-axis motion platform on which they are placed. Perhaps the most important use of flight simulators is to train crews in emergency situations, so that they can experience firsthand situations that could not safely be demonstrated in actual flight training. However, the simulator is also far less expensive than using actual aircraft for routine transition and proficiency training. So realistic is simulator training that airline crews are sometimes qualified on a new aircraft in a simulator prior to ever flying the aircraft itself. There are a number of ways to identify aircraft by type. The primary distinction is between those that are lighter than air and those that are heavier than air. Aircraft such as balloons, nonrigid airships (blimps), and dirigibles are designed to contain within their structure a sufficient volume that, when filled with a gas lighter than air (heated air, hydrogen, or helium), displaces the surrounding ambient air and floats, just as a cork does on the water. Balloons are not steerable and drift with the wind. Nonrigid airships, which have enjoyed a rebirth of use and interest, do not have a rigid structure but have a defined aerodynamic shape, which contains cells filled with the lifting agent. They have a source of propulsion and can be controlled in all three axes of flight. Dirigibles are no longer in use, but they were lighter-than-air craft with a rigid internal structure, which was usually very large, and they were capable of relatively high speeds. It proved impossible to construct dirigibles of sufficient strength to withstand routine operation under all weather conditions, and most suffered disaster, either breaking up in a storm, as with the U.S. craft Shenandoah, Akron, and Macon, or through ignition of the hydrogen, as with the German Hindenburg in 1937. This type of aircraft must have a power source to provide the thrust necessary to obtain lift. Simple heavier-than-air craft include kites. These are usually a flat-surfaced structure, often with a stabilizing “tail,” attached by a bridle to a string that is held in place on the ground. Lift is provided by the reaction of the string-restrained surface to the wind. Another type of unmanned aircraft is the unmanned aerial vehicle(UAV). Sometimes called drones or remotely piloted vehicles (RPVs), these aircraft are radio-controlled from the air or the ground and are used for scientific and military purposes. Unpowered manned heavier-than-air vehicles must be launched to obtain lift. These include hang gliders, gliders, and sailplanes. Hang gliders are aircraft of various configurations in which the pilot is suspended beneath the (usually fabric) wing to provide stability and control. They are normally launched from a high point. In the hands of an experienced pilot, hang gliders are capable of soaring (using rising air columns to obtain upward gliding movement). Gliders are usually used for flight training and have the capability to fly reasonable distances when they are catapulted or towed into the air, but they lack the dynamic sophistication of sailplanes. These sophisticated unpowered craft have wings of unusually high aspect ratio (that is, a long wing span in proportion to wing width). Most sailplanes are towed to launch altitude, although some employ small, retractable auxiliary engines. They are able to use thermals (currents more buoyant than the surrounding air, usually caused by higher temperature) and orographic lift to climb to higher altitude and to glide for great distances. Orographic lift results from the mechanical effect of wind blowing against a terrain feature such as a cliff. The force of the wind is deflected upward by the face of the terrain, resulting in a rising current of air. Ultralights, which were originally merely hang gliders adapted for power by the installation of small engines similar to those used in chain saws, have matured into specially designed aircraft of very low weight and power but with flying qualities similar to conventional light aircraft. They are intended primarily for pleasure flying, although advanced models are now used for training, police patrol, and other work, including a proposed use in combat. Experimental craft have been designed to make use of human and solar power. These are very lightweight, sophisticated aircraft, designed with heavy reliance on computers and using the most modern materials. Paul MacCready of Pasadena, California, U.S., was the leading exponent of the discipline; he first achieved fame with the human-powered Gossamer Condor, which navigated a short course in 1977. Two of his later designs, the human-powered Gossamer Albatrossand the solar-powered Solar Challenger, successfully crossed the English Channel. Others in the field have carried on MacCready’s work, and a human-powered helicopter has been flown. Solar-powered aircraft are similar to human-powered types, except that they use solar panels to convert the Sun’s energy directly to power an electric motor. All nonmilitary planes are civil aircraft. These include private and business planes and commercial airliners. Private aircraft are personal planes used for pleasure flying, often single-engine monoplanes with nonretractable landing gear. They can be very sophisticated, however, and may include such variants as: “warbirds,” ex-military planes flown for reasons of nostalgia, ranging from primary trainers to large bombers; “homebuilts,” aircraft built from scratch or from kits by the owner and ranging from simple adaptations of Piper Cubs to high-speed, streamlined four-passenger transports; antiques and classics, restored older aircraft flown, like the warbirds, for reasons of affection and nostalgia; and aerobatic planes, designed to be highly maneuverable and to perform in air shows. Business aircraft are used to generate revenues for their owners and include everything from small single-engine aircraft used for pilot training or to transport small packages over short distances to four-engine executive jets that can span continents and oceans. Business planes are used by salespeople, prospectors, farmers, doctors, missionaries, and many others. Their primary purpose is to make the best use of top executives’ time by freeing them from airline schedules and airport operations. They also serve as an executive perquisite and as a sophisticated inducement for potential customers. Other business aircraft include those used for agricultural operations, traffic reporting, forest-fire fighting, medical evacuation, pipeline surveillance, freight hauling, and many other applications. One unfortunate but rapidly expanding segment of the business aircraft population is that which employs aircraft illegally for transporting narcotics and other illicit drugs. A wide variety of similar aircraft are used for specialized purposes, like the investigation of thunderstorms, hurricane tracking, aerodynamic research and development, engine testing, high-altitude surveillance, advertising, and police work. 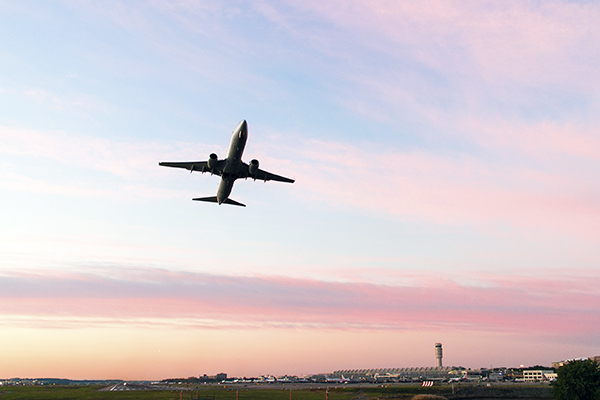 Commercial airliners are used to haul passengers and freight on a scheduled basis between selected airports. They range in size from single-engine freight carriers to the Boeing 747 and in speed from below 200 miles per hour to supersonic, in the case of the Anglo-French Concorde, which was in service from 1976 to 2003. Aircraft can also be categorized by their configurations. One measure is the number of wings, and the styles include monoplanes, with a single wing (that is, on either side of the fuselage); biplanes, with two wings, one atop the other; and even, though rarely, triplanes and quadplanes. A tandem-wing craft has two wings, one placed forward of the other. The wing planform is the shape it forms when seen from above. Delta wings are formed in the shape of the Greek letter delta (Δ); they are triangular wings lying at roughly a right angle to the fuselage. The supersonic Concorde featured delta wings. Swept wings are angled, usually to the rear and often at an angle of about 35°. Forward swept wings also are used on some research craft. Some aircraft have wings that may be adjusted in flight to attach at various angles to the fuselage; these are called variable incidence wings. Variable geometry (swing) wings can vary the sweep (i.e., the angle of a wing with respect to the plane perpendicular to the longitudinal axis of the craft) of their wings in flight. These two types have primarily military applications, as does the oblique wing, in which the wing is attached at an angle of about 60° as an alternative to the standard symmetrical wing sweep. Another configuration limited to military craft is the so-called flying wing, a tailless craft having all its elements encompassed within the wing structure (as in the Northrop B-2 bomber). Unlike the flying wing, the lifting-body aircraft (such as the U.S. space shuttle) generates lift in part or totally by the shape of the fuselage rather than the wing, which is severely reduced in size or altogether absent. Another means of categorizing aircraft is by the type of gear used for takeoff and landing. In a conventional aircraft the gear consists of two primary wheels under the forward part of the fuselage and a tailwheel. The opposite configuration is called a tricycle gear, with a single nose wheel and two main wheels farther back. An aircraft with two main undercarriage assemblies in the fuselage and wing tip protector wheels is said to have bicycle gear. Large aircraft, such as the Boeing 747, incorporate multiple bogies (several wheels arranged in a variety of configurations) in their landing gear to spread out the weight of the aircraft and to facilitate stowage after retraction in flight. A few aircraft use skis or other structures to allow takeoff from or landing in water. These include floatplanes, which are fitted with pontoons for operation on water; flying boats, in which the fuselage also serves as a hull for water travel; and amphibians, which are equipped to land on and take off from both land and water. The demands placed on naval planes used on aircraft carriers require a heavier structure to withstand the stresses of catapult launches and landings abruptly terminated by arresting gear. Landing-gear mechanisms are also reinforced, and a tail hook is installed to engage the arresting gear, a system that is also used for land-based heavy military aircraft. The mode of takeoff and landing also differs among aircraft. Conventional craft gather speed (to provide lift) on an airfield prior to liftoff and land on a similar flat surface. A variety of means have been used in the design of aircraft intended to accomplish short takeoffs and landings (STOL vehicles). These range from optimized design of the wing, fuselage, and landing gear as in the World War II Fieseler Storch (which featured Handley Page automatic slots, extendable flaps, and a long-stroke undercarriage) to the combination of generous wing area, large flap area, and the use of large propellers to direct airflow over the wing as in the prewar Crouch-Bolas, or even such specialized innovations as large U-shaped channels in the wings as with the Custer Channel Wing aircraft. Vertical-takeoff-and-landing (VTOL) vehicles include the helicopter, tilt rotors, and “jump jets,” which lift off from the ground in a vertical motion. Single-stage-to-orbit (SSTO) aircraft can take off and land on conventional runways but can also be flown into an orbital flight path. The engines used to provide thrust may be of several types. Often an internal-combustion piston engine is used, especially for smaller planes. They are of various types, based on the arrangement of the cylinders. Horizontally opposed engines employ four to six cylinders lying flat and arrayed two or three on each side. In a radial engine the cylinders (ranging from 5 to as many as 28, depending on engine size) are mounted in a circle around the crankshaft, sometimes in banks of two or more. Once the dominant piston-engine type, radials are now in only limited production; most new requirements are met by remanufacturing existing stock. Four to eight cylinders may be aligned one behind the other in an in-line engine; the cylinders may be upright or inverted, the inverted having the crankshaft above the cylinders. V-type in-line engines, with the cylinders arranged in banks of three, four, or six, also are used. An early type of engine in which the propeller is affixed to the body of the cylinders, which rotate around a stationary crankshaft, is the rotary engine. Modern rotary engines are patterned after the math principle of internal-combustion engines. Automobile and other small engines are modified for use in homebuilt and ultralight aircraft. These include two-stroke, rotary, and small versions of the conventional horizontally opposed type. Early in aviation history, most aircraft engines were liquid-cooled, first by water, then by a mixture of water and ethylene glycol, the air-cooled rotaries being an exception. After Charles Lindbergh’s epic transatlantic flight in 1927, a trend began toward radial air-cooled engines for reasons of reliability, simplicity, and weight reduction, especially after streamlined cowlings (covers surrounding aircraft engines) were developed to smooth out air flow and aid cooling. Designers continued to use liquid-cooled engines when low frontal drag was an important consideration. Because of advances in engine cooling technology, there has emerged a minor trend to return to liquid-cooled engines for higher efficiency. The gas turbine engine has almost completely replaced the reciprocating engine for aircraft propulsion. Jet engines derive thrust by ejecting the products of combustion in a jet at high speed. A turbine engine that passes all the air through the combustion chamber is called a turbojet. Because its basic design employs rotating rather than reciprocating parts, a turbojet is far simpler than a reciprocating engine of equivalent power, weighs less, is more reliable, requires less maintenance, and has a far greater potential for generating power. It consumes fuel at a faster rate, but the fuel is less expensive. In simplest terms, a jet engine ingests air, heats it, and ejects it at high speed. Thus in a turbojet, ambient air is taken in at the engine inlet (induction), compressed about 10 to 15 times in a compressor consisting of rotor and stator blades (compression), and introduced into a combustion chamber where igniters ignite the injected fuel (combustion). The resulting combustion produces high temperatures (on the order of 1,400 to 1,900 °F [760 to 1,040 °C]). The expanding hot gases pass through a multistage turbine, which turns the air compressor through a coaxial shaft, and then into a discharge nozzle, thereby producing thrust from the high-velocity stream of gases being ejected to the rear (exhaust). A turbofan is a turbine engine having a large low-pressure fan ahead of the compressor section; the low-pressure air is allowed to bypass the compressor and turbine, to mix with the jet stream, increasing the mass of accelerated air. This system of moving large volumes of air at a slower speed raises efficiency and cuts both fuel consumption and noise. A turboprop is a turbine engine connected by a reduction gearbox to a propeller. Turboprop engines are typically smaller and lighter than a piston engine, produce more power, and burn more but cheaper fuel. Propfans, unducted fan jet engines, obtain ultrahigh bypass airflow using wide chord propellers driven by the jet engine. Rockets are purely reactive engines, which usually use a fuel and an oxidizing agent in combination. They are used primarily for research aircraft and for launching the space shuttle vehicles and satellites. A ramjet is an air-breathing engine that, after being accelerated to high speeds, acts like a turbojet without the need for a compressor or turbine. A scramjet (supersonic combustion ramjet) is an engine designed for speeds beyond Mach 6, which mixes fuel into air flowing through it at supersonic speeds; it is intended for hypersonic aircraft. Jet engines are variously disposed, but the most common arrangement is to have them placed underneath the wing in nacelles suspended on pylons or placed on stub fixtures at the rear of the fuselage. Supersonic and hypersonic aircraft are usually designed with the engine as an integral part of the undersurface of the fuselage, while in some special military stealth applications, the engine is entirely submerged within the wing or fuselage structure. For reasons of availability, low weight, and prior manufacturing experience, most early aircraft were of wood and fabric construction. At the lower speeds then obtainable, streamlining was not a primary consideration, and many wires, struts, braces, and other devices were used to provide the necessary structural strength. Preferred woods were relatively light and strong (e.g., spruce), and fabrics were normally linen or something similarly close-weaved, not canvas as is often stated. As speeds advanced, so did structural requirements, and designers analyzed individual aircraft parts for both strength and wind resistance. Bracing wires were given a streamlined shape, and some manufacturers began to make laminated wood fuselages of monocoque construction (stresses carried by the skin) for greater strength, better streamlining, and lighter weight. The 1912 record-setting French Deperdussin racers, the German Albatros fighters of World War I, and the later American Lockheed Vega were among the aircraft that used this type of construction. Aircraft made of wood and fabric were difficult to maintain and subject to rapid deterioration when left out in the elements. This, plus the need for greater strength, led to the use of metal in aircraft. The first general use was in World War I, when the Fokker aircraft company used welded steel tube fuselages, and the Junkers company made all-metal aircraft of dual tubing and aluminum covering. During the period from 1919 through 1934, there was a gradual trend to all-metal construction, with some aircraft having all-metal (almost always of aluminum or aluminum alloy) structures with fabric-covered surfaces, and others using an all-metal monocoque construction. Metal is stronger and more durable than fabric and wood, and, as the necessary manufacturing skills were developed, its use enabled airplanes to be both lighter and easier to build. On the negative side, metal structures were subject to corrosion and metal fatigue, and new procedures were developed to protect against these hazards. A wide variety of aluminum alloys were developed, and exotic metals like molybdenum and titanium were brought into use, especially in vehicles where extreme strength or extraordinary thermal resistance was a requirement. As aircraft were designed to operate at Mach 3 (three times the speed of sound) and beyond, a variety of techniques to avoid the effects of aerodynamic heating were introduced. These include the use of fuel in the tanks as a “heat sink” (to absorb and dissipate the generated heat), as well as the employment of exotic materials such as the advanced carbon-carbon composites, silicon carbide ceramic coatings, titanium-aluminum alloys, and titanium alloys reinforced with ceramic fibres. Additionally, some designs call for the circulation of very cold hydrogen gas through critical areas of aerodynamic heating. While the basic principles of flight that the Wright brothers applied still pertain, there have been enormous changes over the years to the means by which those principles are understood and applied. The most pervasive and influential of these changes is the broad variety of applications of computer technology in all aspects of aviation. A second factor has been the widespread development of the use of composite materials in aircraft structures. 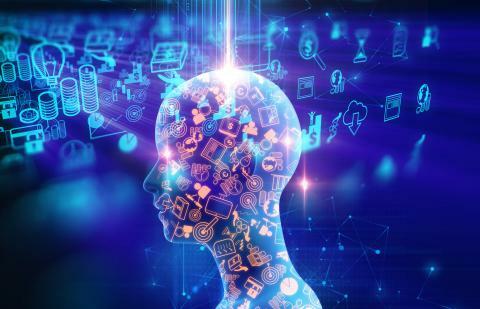 While these two elements are the results of advances in engineering, they are also indirectly the product of changing social and legal considerations. The social issues are manifold and include the increasing global interdependence of business, the unprecedented political revolutions in every part of the world, and the universal human desire for travel. All these come at a time when diminishing fossil-fuel resources have caused large increases in fuel prices. As a result, both computers and composite materials are necessary to create lighter, stronger, safer, more fuel-efficient aircraft. The legal issues are equally complex, but for the purposes of this section revolve around two elements. The first of these is that the design, test, and certification of an aircraft has become such an extraordinarily costly project that only the most well-funded companies can undertake the development of even relatively small aircraft. For larger aircraft it is now common practice for several manufacturers, often from different countries, to ally themselves to underwrite a new design. This international cooperation was done most successfully first with the Anglo-French Concorde supersonic transport and has since been evident in a number of aircraft. A component of this process is the allocation of the production of certain elements of the aircraft in certain countries, as a quid pro quo for those countries not developing indigenous aircraft of a similar type. The second legal element is that the potential of very large damages being awarded as a result of liability in the event of a crash has forced most aircraft companies to cease the manufacture of the smaller types of personal aircraft. The reason for this is that the exposure to damages from a large number of small single-engine planes is greater than the exposure from the equivalent market value of a few larger planes, because the larger planes generally have better maintenance programs and more highly trained pilots. The practical effect of this has been an enormous growth in the home-built aircraft industry, where, ironically, the use of computers and composites have effected a revolution that has carried over to the commercial aircraft industry. Since the mid-1960s, computer technology has been continually developed to the point at which aircraft and engine designs can be simulated and tested in myriad variations under a full spectrum of environmental conditions prior to construction. As a result, practical consideration may be given to a series of aircraft configurations, which, while occasionally and usually unsuccessfully attempted in the past, can now be used in production aircraft. These include forward swept wings, canard surfaces, blended body and wings, and the refinement of specialized airfoils (wing, propeller, and turbine blade). With this goes a far more comprehensive understanding of structural requirements, so that adequate strength can be maintained even as reductions are made in weight. Complementing and enhancing the results of the use of computers in design is the pervasive use of computers on board the aircraft itself. Computers are used to test and calibrate the aircraft’s equipment, so that, both before and during flight, potential problems can be anticipated and corrected. Whereas the first autopilots were devices that simply maintained an aircraft in straight and level flight, modern computers permit an autopilot system to guide an aircraft from takeoff to landing, incorporating continuous adjustment for wind and weather conditions and ensuring that fuel consumption is minimized. In the most advanced instances, the role of the pilot has been changed from that of an individual who continuously controlled the aircraft in every phase of flight to a systems manager who oversees and directs the human and mechanical resources in the compartment for the pilot, and sometimes also the crew, in an aircraft or spacecraft. The use of computers for design and in-flight control is synergistic, for more radical designs can be created when there are on-board computers to continuously adapt the controls to flight conditions. The degree of inherent stability formerly desired in an aircraft design called for the wing, fuselage, and empennage (tail assembly) of what came to be conventional size and configurations, with their inherent weight and drag penalties. By using computers that can sense changes in flight conditions and make corrections hundreds and even thousands of times a second—far faster and more accurately than any pilot’s capability—aircraft can be deliberately designed to be unstable. Wings can, if desired, be given a forward sweep, and tail surfaces can be reduced in size to an absolute minimum (or, in a flying wing layout, eliminated completely). Airfoils can be customized not only for a particular aircraft’s wing or propeller but also for particular points on those components. The use of composite materials, similarly assisted in both design and application by the use of computers, has grown from the occasional application for a nonstructural part (e.g., a baggage compartment door) to the construction of complete airframes. These materials have the additional advantage in military technology of having a low observable (stealth) quality to radar. Some aircraft of composite materials began to appear in the late 1930s and ’40s; normally these were plastic-impregnated wood materials, the most famous (and largest) example of which is the Duramold construction of the eight-engine Hughes flying boat. A few production aircraft also used the Duramold construction materials and methods. During the late 1940s, interest developed in fibreglass materials, essentially fabrics made up of glass fibres. By the 1960s, enough materials and techniques had been developed to make more extensive use possible. The term “composite” for this method of construction indicates the use of different materials that provide strengths, light weight, or other functional benefits when used in combination that they cannot provide when used separately. They usually consist of a fibre-reinforced resin matrix. The resin can be a vinyl ester, epoxy, or polyester, while the reinforcement might be any one of a variety of fibres, ranging from glass through carbon, boron, and a number of proprietary types. To these basic elements, strength is sometimes added by the addition of a core material, making in effect a structural sandwich. A core can be made up of a number of plastic foams (polystyrene, polyurethane, or others), wood, honeycombs (multicellular structures) of paper, plastic, fabric or metal, and other materials. The desired final shape, in terms of both external appearance and the internal structure required for adequate strength, of a component made of composite materials can be arrived at by a variety of means. The simplest is the laying up of fibreglass sheets, much as is done in building a canoe, impregnating the sheets with a resin, and letting the resin cure. More sophisticated techniques involve fashioning the material into specific shapes by elaborate machinery. Some techniques require the use of male or female molds or both, while others employ vacuum bags that allow the pressure of the atmosphere to press the parts into the desired shape. The use of composite materials opened up whole new methods of construction and enabled engineers to create less expensive, lighter, and stronger parts of more streamlined shapes than had previously been feasible with wood or metal. Like the computer, the use of composites has spread rapidly throughout the industry and will be developed even further in the future. The coincident arrival of the new technology in computers and composite materials influenced commercial air transportation, where aircraft larger than the Boeing 747 and faster than the Concorde are not only possible but inevitable. In the field of business aircraft, the new technologies have resulted in a host of executive aircraft with the most modern characteristics. These include the uniquely configured Beech Starship, which is made almost entirely of composite materials, and the Piaggio Avanti, which also has a radical configuration and employs primarily metal construction but includes a significant amount of composite material. Commercial air transports are using composite materials in increasing amounts and may ultimately follow the pattern of the military services, where large aircraft like the Northrop B-2 are made almost entirely of advanced composite materials. The previously mentioned legal considerations, combined with the advances in computers and composites, has completely revised the role of the homebuilt aircraft. While the homebuilt aircraft has always been a part of the aviation scene (the Wright Flyer was in fact a “homebuilt”), the designs were for years typically quite conventional, often using components from existing aircraft. Since the emergence of the Experimental Aircraft Association (founded 1953) in the United States, the homebuilt movement has operated in advance of the aviation industry, pioneering the use of computers and composites and, especially, radical configurations. While there are many practitioners in the field, one man, the American designer Burt Rutan, epitomized this transition of the homebuilt movement from backyard to leading-edge status. Rutan, of Mojave, California, had a long series of successful designs, which reached the highest degree of recognition with the Voyager aircraft, in which his brother Rutan and Jeana Yeager made a memorable nonstop, nonrefueled flight around the world in 1986. Three other areas of civil aviation have benefited enormously from these advances in technology. The first of these are vertical-takeoff-and-landing aircraft, including helicopters. The second are sailplanes, which have reached new levels in structural and aerodynamic refinement. The third are the wide variety of hang gliders and ultralight aircraft, as well as the smaller but more sophisticated aircraft that depend on human or solar power. Each of these has been vastly improved by contemporary advances in design and construction, and each holds great promise for the future. Pigeon, common name for members of the large family Columbidae, land birds, cosmopolitan in temperate and tropical regions, characterized by stout bodies, short necks, small heads, and thick, heavy plumage. The names dove and pigeon are used interchangeably, though the former generally refers to smaller members of the family. All pigeons have soft swellings (ceres) at the base of the nostrils, feed their young with "pigeon's milk" regurgitated from the crops of the parents, and have specialized bills through which they can drag up water steadily, unlike other birds. They eat chiefly fruits and seeds. From ancient times, pigeons—especially homing pigeons, which are also used as racing birds - have been used for carrying messages. Although electronics has largely replaced them as messengers, they are still of experimental importance. It is thought that they may navigate by the sun. Monogamous and amorous, pigeons are known for their soft cooing calls. The most common American wild pigeon is the small, gray-brown mourning dove Zenaidura macroura (sometimes called turtledove), similar to the once abundant passenger pigeon, which was slaughtered indiscriminately and became extinct in 1914. Other wild American species are the band-tailed, red-billed, and white-crowned pigeons, all of the genus Columba, and the reddish brown ground-doves (genus Columbina). The Australasian region has two thirds of the 289 species of pigeons, of which the fruit pigeons are the most colorful and the gouras, or crowned pigeons, the largest (to 33 in./84 cm). In Europe the turtledove, rock pigeon or dove, stock dove, and ringdove or wood pigeon are common. The rock dove, Columba livia, of temperate Europe and W Asia is the wild progenitor of the common street and domestic pigeons. Domesticated varieties developed by selective breeding include the fantail, with numerous erectile tail feathers; the Jacobin, with a hoodlike ruff; the tumbler, which turns backward somersaults in flight; the pouter, with an enormous crop; and the quarrelsome carrier, with rosettelike eyes and nose wattles. Many species are valued as game birds; their close relationship to the Gallinae (e.g., pheasants and turkeys) is illustrated by the sand grouse, an Old World pigeon named for its resemblance to the grouse. In religion and art the dove symbolizes peace and gentleness, and in Greek mythology it was sacred to Aphrodite. The long-extinct dodo and solitaire birds were members of this order. Pigeons are classified in the phylum Chordata, subphylum Vertebrata, class Aves, order Columbiformes, family Columbidae. 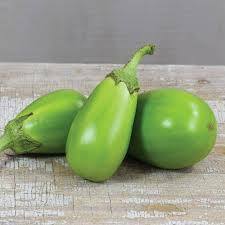 Eggplant, (Solanum melongena), also called aubergine or Guinea squash, tender perennial plant of the nightshade family (Solanaceae), grown for its edible fruits. 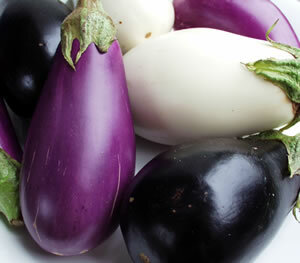 Eggplant requires a warm climate and has been cultivated in its native Southeast Asia since remote antiquity. A staple in cuisines of the Mediterranean region, eggplant figures prominently in such classic dishes as the Greek moussaka, the Italian eggplant parmigiana, and the Middle Eastern relish baba ghanoush. It is also frequently served as a baked, grilled, fried, or boiled vegetable and is used as a garnish and in stews. The plant is closely related to the tomato (Solanum lycopersicum) and the potato (S. tuberosum) as well as to several poisonous nightshades. Eggplant is usually grown as an annual and features an erect bushy stem that is sometimes armed with spines. The leaves are large, ovate, and slightly lobed. The pendant violet flowers are characteristically solitary and approximately 5 cm (2 inches) across. The fruit is a large egg-shaped berry with a glossy surface that varies in colour from dark purple to red, pink, yellowish, or white and is sometimes striped; the colour and shape of the white variety is the source of the common name. Eggplant, name for Solanum melongena, a large-leaved woody perennial shrub (often grown as an annual herb) of the family Solanaceae (nightshade family), and also cultivated for its ovoid fruit. Native to SE Asia, the eggplant is raised in tropical and (as an annual) in warm climates as a garden vegetable and is a staple in parts of the Middle East. The fruit (a berry, like its relative the tomato) varies in size and may be black, purple, white, or striped. 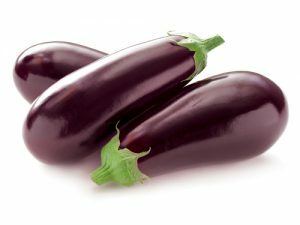 Eggplants are classified in the division Magnoliophyta, class Magnoliopsida, order Polemoniales, family Solanaceae. The fruit (a berry, like its relative the tomato) varies in size and may be black, purple, white, or striped. Wow. Never saw any non-purple eggplant. Can you show me the striped ones? Wow. It looks like the purple has been peeled off. Cardamom, also spelled cardamon, spice consisting of whole or ground dried fruit, or seeds, of Elettaria cardamomum, a herbaceous perennial of the ginger family (Zingiberaceae). The seeds have a warm, slightly pungent, and highly aromatic flavour somewhat reminiscent of camphor. They are a popular seasoning in South Asian dishes, particularly curries, and in Scandinavian pastries. Native to the moist forests of southern India, cardamom fruit may be collected from wild plants; but most is cultivated in India, Sri Lanka, and Guatemala. Leafy shoots arise 1.5 to 6 metres (5 to 20 feet) from the branching rootstock. Flowering shoots, approximately 1 metre long, may be upright or sprawling; each bears numerous flowers about 5 cm (2 inches) in diameter with greenish petals and a purple-veined white lip. The whole fruit, 0.8 to 1.5 cm, is a green, three-sided oval capsule containing 15 to 20 dark, reddish brown to brownish black, hard, angular seeds. They are picked or clipped from the stems just before maturity, cleansed, and dried in the sun or in a heated curing chamber. Cardamom may be bleached to a creamy white colour in the fumes of burning sulfur. After curing and drying, the small stems of the capsules are removed by winnowing. 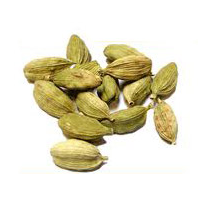 Decorticated cardamom consists of husked dried seeds. The essential oil occurs in large parenchyma cells underlying the epidermis of the seed coat. The essential oil content varies from 2 to 10 percent; its principal components are cineole and α-terpinyl acetate. Cardamom : The seeds and dried, nearly ripe, fruit of Elettaria cardamomum, a member of the ginger family. An aromatic spice used as a flavouring in sausages, bakery goods, sugar confectionery, and whole in mixed pickling spice. It is widely used in Indian cooking (the Hindi name is elaichi), and as one of the ingredients of curry powder. Arabic coffee (similar to Turkish coffee) is flavoured with ground cardamom seeds. 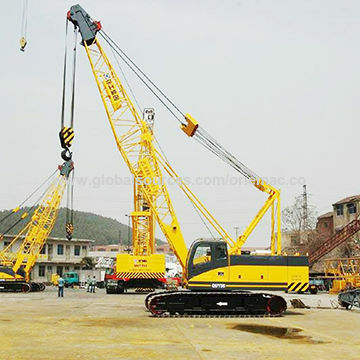 Crane, any of a diverse group of machines that not only lift heavy objects but also shift them horizontally. Cranes are distinct from hoists, passenger elevators, and other devices intended solely or primarily for vertical lifting and from conveyors, which continuously lift or carry bulk materials such as grain or coal. Cranes have come into their present widespread application only since the introduction of steam engines, internal-combustion engines, and electric motors, beginning in the 19th century. The most prominent component of that class of cranes known as derrick cranes is the jib, or boom; this is a long beam that is structurally reinforced so that it will not bend. The jib is supported or held aloft by guy wires running from its top to a vertical mast, or pillar, that is itself stiffly braced; the guy wires set the angle at which the jib leans. Along the entire length of the jib runs a pulley system whose cables or chains are wound and unwound around a drum, or cylinder, that is placed at the jib’s base and is turned by a motor. The cable dropping from the top of the jib is attached to loads and lifts them vertically. The loads may also be moved from side to side by having the jib pivot, or rotate, on its base around the mast. A traveling jib crane is one in which the pulley system is suspended from a trolley, or wheeled carriage, moving along the length of the jib. Such traveling cranes usually have lifting capacities of from 5 to 250 tons. A potentially more powerful derrick is the floating crane, which is built on a barge for such purposes as constructing bridges or salvaging sunken objects. The Musashi, a large crane of this type built in Japan in 1974, can lift a 3,000-ton load. Problems in maintaining stability always arise with jib cranes, and in the case of larger cranes that lift heavy loads at long outreaches, special care has to be taken to avoid tipping of the crane. For this purpose, besides the usual practice of mounting the hoisting machinery in such a way as to counterpoise part of the load on the boom, special ballast weights must be added to ensure that the crane will not be overturned. The cantilever crane, a type much used in the construction of ships and tall buildings, has a horizontal boom that rests upon and can rotate about a vertical mast. The load is suspended from a trolley that can move along a track on the boom. A cantilever crane used in shipyards. During the erection of a building of many stories, the mast of a cantilever crane may be extended upward repeatedly as the height of the building increases. Bridge cranes comprise another important class of cranes in which the pulley system is suspended from a trolley that moves on tracks along one or two horizontal beams, called the bridge, that are supported at both ends. In most cases, the bridge itself can move along a pair of parallel rails, so that the crane can serve a large rectangular area. A circular space can be served by a rotary bridge crane, in which one end of the overhead beam is supported by a central pivot while the other end moves on a circular rail on the periphery of the area. The overhead traveling crane, a bridge crane for which the rails are mounted above the level of the ground or floor, has the advantage of causing no obstruction of the working area. Overhead traveling cranes are commonly used indoors, where their rails can be attached to the columns that support the roof. If the construction of overhead rails is impracticable, the ends of the bridge can be attached to upright towers that move on rails at the ground level; such cranes are called gantry, or goliath, cranes. Simple machine, any of several devices with few or no moving parts that are used to modify motion and force in order to perform work. The simple machines are the inclined plane, lever, wedge, wheel and axle, pulley, and screw. An inclined plane consists of a sloping surface; it is used for raising heavy bodies. The plane offers a mechanical advantage in that the force required to move an object up the incline is less than the weight being raised (discounting friction). The steeper the slope, or incline, the more nearly the required force approaches the actual weight. Expressed mathematically, the force F required to move a block D up an inclined plane without friction is equal to its weight W times the sine of the angle the inclined plane makes with the horizontal (θ). The equation is F = Wsin θ. The principle of the inclined plane is used widely—for example, in ramps and switchback roads, where a small force acting for a distance along a slope can do a large amount of work. A lever is a bar or board that rests on a support called a fulcrum. A downward force exerted on one end of the lever can be transferred and increased in an upward direction at the other end, allowing a small force to lift a heavy weight. All early people used the lever in some form, for example, for moving heavy stones or as digging sticks for land cultivation. The principle of the lever was used in the swape, or shadoof, a long lever pivoted near one end with a platform or water container hanging from the short arm and counterweights attached to the long arm. A man could lift several times his own weight by pulling down on the long arm. This device is said to have been used in Egypt and India for raising water and lifting soldiers over battlements as early as 1500 BCE. A wedge is an object that tapers to a thin edge. Pushing the wedge in one direction creates a force in a sideways direction. It is usually made of metal or wood and is used for splitting, lifting, or tightening, as in securing a hammer head onto its handle. The wedge was used in prehistoric times to split logs and rocks; an ax is also a wedge, as are the teeth on a saw. In terms of its mechanical function, the screw may be thought of as a wedge wrapped around a cylinder. A wheel and axle is made up of a circular frame (the wheel) that revolves on a shaft or rod (the axle). In its earliest form it was probably used for raising weights or water buckets from wells. Its principle of operation is best explained by way of a device with a large gear and a small gear attached to the same shaft. The tendency of a force, F, applied at the radius R on the large gear to turn the shaft is sufficient to overcome the larger force W at the radius r on the small gear. The force amplification, or mechanical advantage, is equal to the ratio of the two forces (W:F) and also equal to the ratio of the radii of the two gears (R:r). If the large and small gears are replaced with large- and small-diameter drums that are wrapped with ropes, the wheel and axle becomes capable of raising weights. The weight being lifted is attached to the rope on the small drum, and the operator pulls the rope on the large drum. In this arrangement the mechanical advantage is the radius of the large drum divided by the radius of the small drum. An increase in the mechanical advantage can be obtained by using a small drum with two radii, r1 and r2, and a pulley block. When a force is applied to the large drum, the rope on the small drum winds onto D and off of d.
A measure of the force amplification available with the pulley-and-rope system is the velocity ratio, or the ratio of the velocity at which the force is applied to the rope (VF) to the velocity at which the weight is raised (VW). This ratio is equal to twice the radius of the large drum divided by the difference in the radii of the smaller drums D and d. Expressed mathematically, the equation is VF/VW = 2R/(r2 - r1). The actual mechanical advantage W/F is less than this velocity ratio, depending on friction. A very large mechanical advantage may be obtained with this arrangement by making the two smaller drums D and d of nearly equal radius. A pulley is a wheel that carries a flexible rope, cord, cable, chain, or belt on its rim. Pulleys are used singly or in combination to transmit energyand motion. Pulleys with grooved rims are called sheaves. In belt drive, pulleys are affixed to shafts at their axes, and power is transmitted between the shafts by means of endless belts running over the pulleys. One or more independently rotating pulleys can be used to gain mechanical advantage, especially for lifting weights. The shafts about which the pulleys turn may affix them to frames or blocks, and a combination of pulleys, blocks, and rope or other flexible material is referred to as a block and tackle. The Greek mathematician Archimedes(3rd century BCE) is reported to have used compound pulleys to pull a ship onto dry land. A screw is a usually circular cylindrical member with a continuous helical rib, used either as a fastener or as a force and motion modifier. Although the Pythagorean philosopher Archytas of Tarentum (5th century BCE) is the alleged inventor of the screw, the exact period of its first appearance as a useful mechanical device is obscure. The invention of the water screw is usually ascribed to Archimedes, but evidence exists of a similar device used for irrigation in Egypt at an earlier date. The screw press, probably invented in Greece in the 1st or 2nd century BCE, has been used since the days of the Roman Empire for pressing clothes. In the 1st century CE, wooden screws were used in wine and olive-oil presses, and cutters (taps) for cutting internal threads were in use. Cap and machine screws are used to clamp machine parts together, either when one of the parts has a threaded hole or in conjunction with a nut. These screws stretch when tightened, and the tensile load created clamps the parts together. The setscrew fits into a threaded hole in one member; when tightened, the cup-shaped point is pressed into a mating member (usually a shaft) and prevents relative motion. Self-tapping screws form or cut mating threads by displacing material adjacent to a pilot hole so that it flows around the screw. Wood screws are made in a wide variety of diameters and lengths; when using the larger sizes, pilot holes are drilled to avoid splitting the wood. Lag screws are large wood screws used to fasten heavy objects to wood. Heads are either square or hexagonal. Screws that modify force and motion are known as power screws. A screw jack converts torque (turning moment) to thrust. The thrust (usually to lift a heavy object) is created by turning the screw in a stationary nut. By using a long bar to turn the screw, a small force at the end of the bar can create a large thrust force. Workpiece tables on machine tools are moved linearly on guiding ways by screws that rotate in bearings at the ends of the tables and mate with nuts fixed to the machine frame. A similar torque-to-thrust conversion can be obtained by either rotating an axially fixed screw to drive a rotationally fixed nut along the screw or by rotating an axially fixed nut to drive a rotationally fixed screw through the nut. Pneumonia can range in seriousness from mild to life-threatening. It is most serious for infants and young children, people older than age 65, and people with health problems or weakened immune systems. See your doctor if you have difficulty breathing, chest pain, persistent fever of 102 F (39 C) or higher, or persistent cough, especially if you're coughing up pus. For some older adults and people with heart failure or chronic lung problems, pneumonia can quickly become a life-threatening condition. Many germs can cause pneumonia. The most common are bacteria and viruses in the air we breathe. Your body usually prevents these germs from infecting your lungs. But sometimes these germs can overpower your immune system, even if your health is generally good. Pneumonia is classified according to the types of germs that cause it and where you got the infection. • Bacteria. The most common cause of bacterial pneumonia in the U.S. is Streptococcus pneumoniae. This type of pneumonia can occur on its own or after you've had a cold or the flu. It may affect one part (lobe) of the lung, a condition called lobar pneumonia. • Bacteria-like organisms. Mycoplasma pneumoniae also can cause pneumonia. It typically produces milder symptoms than do other types of pneumonia. Walking pneumonia is an informal name given to this type of pneumonia, which typically isn't severe enough to require bed rest. • Fungi. This type of pneumonia is most common in people with chronic health problems or weakened immune systems, and in people who have inhaled large doses of the organisms. The fungi that cause it can be found in soil or bird droppings and vary depending upon geographic location. • Viruses. Some of the viruses that cause colds and the flu can cause pneumonia. Viruses are the most common cause of pneumonia in children younger than 5 years. Viral pneumonia is usually mild. But in some cases it can become very serious. Some people catch pneumonia during a hospital stay for another illness. Hospital-acquired pneumonia can be serious because the bacteria causing it may be more resistant to antibiotics and because the people who get it are already sick. People who are on breathing machines (ventilators), often used in intensive care units, are at higher risk of this type of pneumonia. Health care-acquired pneumonia is a bacterial infection that occurs in people who live in long-term care facilities or who receive care in outpatient clinics, including kidney dialysis centers. Like hospital-acquired pneumonia, health care-acquired pneumonia can be caused by bacteria that are more resistant to antibiotics. Aspiration pneumonia occurs when you inhale food, drink, vomit or saliva into your lungs. Aspiration is more likely if something disturbs your normal gag reflex, such as a brain injury or swallowing problem, or excessive use of alcohol or drugs. • Being hospitalized. You're at greater risk of pneumonia if you're in a hospital intensive care unit, especially if you're on a machine that helps you breathe (a ventilator). • Chronic disease. You're more likely to get pneumonia if you have asthma, chronic obstructive pulmonary disease (COPD) or heart disease. • Smoking. Smoking damages your body's natural defenses against the bacteria and viruses that cause pneumonia. • Weakened or suppressed immune system. People who have HIV/AIDS, who've had an organ transplant, or who receive chemotherapy or long-term steroids are at risk. • Bacteria in the bloodstream (bacteremia). Bacteria that enter the bloodstream from your lungs can spread the infection to other organs, potentially causing organ failure. • Difficulty breathing. If your pneumonia is severe or you have chronic underlying lung diseases, you may have trouble breathing in enough oxygen. You may need to be hospitalized and use a breathing machine (ventilator) while your lung heals. • Fluid accumulation around the lungs (pleural effusion). Pneumonia may cause fluid to build up in the thin space between layers of tissue that line the lungs and chest cavity (pleura). If the fluid becomes infected, you may need to have it drained through a chest tube or removed with surgery. • Lung abscess. An abscess occurs if pus forms in a cavity in the lung. An abscess is usually treated with antibiotics. Sometimes, surgery or drainage with a long needle or tube placed into the abscess is needed to remove the pus. • Get vaccinated. Vaccines are available to prevent some types of pneumonia and the flu. Talk with your doctor about getting these shots. The vaccination guidelines have changed over time so make sure to review your vaccination status with your doctor even if you recall previously receiving a pneumonia vaccine. • Make sure children get vaccinated. Doctors recommend a different pneumonia vaccine for children younger than age 2 and for children ages 2 to 5 years who are at particular risk of pneumococcal disease. Children who attend a group child care center should also get the vaccine. Doctors also recommend flu shots for children older than 6 months. • Practice good hygiene. To protect yourself against respiratory infections that sometimes lead to pneumonia, wash your hands regularly or use an alcohol-based hand sanitizer. • Don't smoke. Smoking damages your lungs' natural defenses against respiratory infections. • Keep your immune system strong. Get enough sleep, exercise regularly and eat a healthy diet. Pus is a yellow-white, more or less viscid substance produced by suppuration and found in abscesses, sores, etc., consisting of a liquid plasma in which white blood cells are suspended.